The new DFP 2000 from Spectrodyne, Inc. is a rugged, light weight, state of the art disappearing filament optical pyrometer built to provide many years of dependable service. The DFP 2000 is based on the disappearing filament principle - where the brightness of a hot target is matched by the brightness of a calibrated lamp filament - to achive highly accurate measurements. The DFP 2000 can solve temperature measurement problems that are often outside the capabilities of conventional and two color pyrometers. LARGE EMISSIVITY ERRORS: Of all the types of pyrometers that operate on the principle of radiation measurement, disappearing filament optical pyrometers generally have the lowest error due to emissivity. The reason being, that emissivity errors become dramatically larger as the operating wavelength of the pyrometer increases. The operating wavelength of the disappearing filament optical pyrometer is only 0.65 microns. 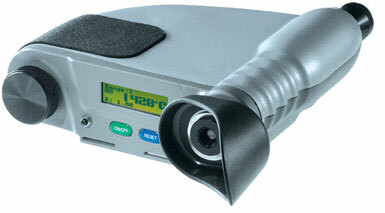 At 1.1 microns the average infrared pyrometer’s operating wavelength is almost 70% longer. NARROW SIGHTING PATHS: Long narrow sighting paths can obstruct the field of view of infrared thermometers causing large errors. Since the eye is the employed sensor in disappearing filament optical pyrometers, the operator can make the measurement as long as the target is in his field of vision. OBSTRUCTED SIGHTING PATHS: Targets that are partially obstructed may not fill the field of view requirements of the infrared thermometer in use. Again, the only field of view requirement for disappearing filament optical pyrometers is that the operators can make adequate eye contact with the target. ULTRA HIGH TEMPERATURES: The most popular disappearing filament optical pyrometers have standard ranges to 4200C, which can be extended higher with special filters. SMALL TARGETS: While production models are capable of measuring incandescent objects as small as 0.01 inches, the spot size of disappearing filament optical pyrometers can be extended to 0.003 inches or less with optional lenses. MEASURING FINE WIRES: Wire manufacturers have used disappearing filament optical pyrometers for years to solve this difficult measurement. Again, the operator can successfully use the direct line of sight targeting ability of the human eye to resolve small targets. TARGET RESOLUTION: The temperature measurement challenges in the above examples can be solve with disappearing filament optical pyrometers because of the unique targeting capability of these instruments. Basically, if you can see the target with your eye, you can measure the temperature with the disappearing filament optical pyrometer. While the field of view of an infrared thermometer must be kept intact, such is not the case with optical pyrometers. The reason being, that you do not have to worry about a sensor’s field of view being restricted, partially cut off, or otherwise obscured. Your eye is the sensor. As long as you can make visual contact, your can generally make the measurement. Copyright © 2019 Spectrodyne, Inc. All rights reserved.